SUNNYVALE, CA--(Marketwired - Jan 22, 2014) - AMD (NYSE: AMD) today announced the immediate availability of its new 12- and 16-core AMD Opteron™ 6300 Series server processors, code named "Warsaw." 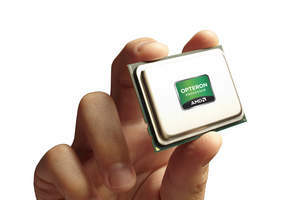 Designed for enterprise workloads, the new AMD Opteron 6300 Series processors feature the "Piledriver" core and are fully socket and software compatible with the existing AMD Opteron 6300 Series. The power efficiency and cost effectiveness of the new products are ideal for the AMD Open 3.0 Open Compute Platform -- the industry's most cost effective Open Compute platform. Driven by customers' requests, the new AMD Opteron™ 6338P (12 core) and 6370P (16 core) processors are optimized to handle the heavily virtualized workloads found in enterprise environments, including the more complex compute needs of data analysis, xSQL and traditional databases, at optimal performance per-watt, per-dollar. "With the continued move to virtualized environments for more efficient server utilization, more and more workloads are limited by memory capacity and I/O bandwidth," said Suresh Gopalakrishnan, corporate vice president and general manager, Server Business Unit, AMD. "The Opteron 6338P and 6370P processors are server CPUs optimized to deliver improved performance per-watt for virtualized private cloud deployments with less power and at lower cost points." The new AMD Opteron 6338P and 6370P processors are available today through Penguin and Avnet system integrators and have been qualified for servers from Sugon and Supermicro at a starting price of $377 and $598, respectively. More information can be found on AMD's website. Visit AMD at our booth at the Open Compute Summit V in San Jose, Calif. on January 28 and 29. *AMD Opteron 6370P 2P SPECint_rate2006 score of 468 at 99W TDP and price of $598 compared to AMD Opteron 6376 2P SPECint_rate2006 score of 528 at 115W TDP and price of $703. AMD today announced 12- and 16-Core additions to the AMD Opteron 6300 Series. These new processors deliver optimized performance per-watt per-dollar for AMD Open 3.0 Open Compute Platforms.